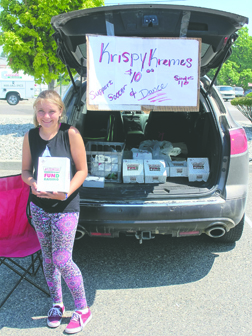 Enterprising businesswoman, Layla Stidman, of Omak, has been selling Krispy Kreme donuts this summer to raise money for soccer and dance camps. She worked the Apple Pie Jamboree last weekend and sold out what stock she had left, Tuesday afternoon, July 18, near Brewster Harvest Foods. Stidman said she plans to sell at the Omak Stampede in August and has ordered 500 boxes of the popular snack to keep up with the demand.